New director brings unique experience for the future of higher education. Sara Baber joined the College of Geosciences in November of 2016 for a newly created position – Director of Distance Learning. Her primary responsibilities include development and implementation of online education programs for the college. With a career in higher education and academic technology that spans 30 years, Sara brings a unique set of skills and experience. She spent time at the University of Massachusetts Dartmouth, the University of North Texas Health Science Center, Case Western Reserve University, the University of Houston, and Oklahoma State University. In the Fall of 2017, Sara will help take part in launching a new online degree for the College of Geosciences. The opportunity to start a whole new program, which is the only online degree of its kind for a Master of Geoscience, was a major aspect of what drew her to Texas A&M. Sara knows a thing or two about that from her own first-hand experience, which gives her a unique perspective for someone in her position. “I earned my doctorate as an online student. 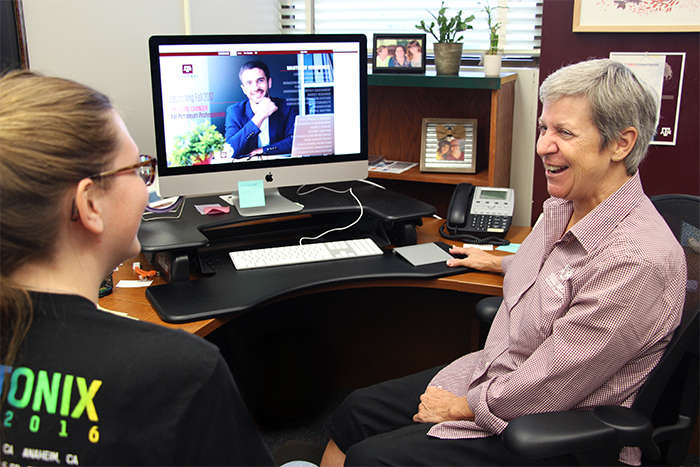 I’ve sat in the online student’s chair, which has helped me immensely,” she said. Sara received her doctorate in Instructional Technology and Distance Education from Nova Southeastern University. Not only is Sara excited about coming in on the ground level with a new online degree program, she’s also encouraged by the timing. According to the U.S. Department of Labor, the necessity for responsible land and resource management, energy, and environmental protection is projected to increase the demand for geoscientists in the coming years. “This is a timely degree with the resurgence of the energy industry,” she pointed out. For more information on the new online degree, go to geosonline.tamu.edu.